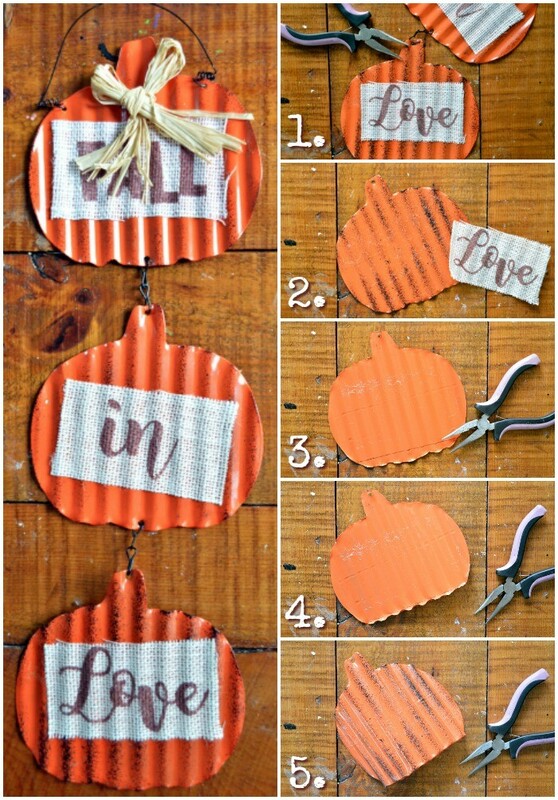 A while back, I shared a few farmhouse fall DIYs with you. Today, I am going share a super quick dollar store tutorial, and then show you how I put all those farmhouse-style pieces together to create a pretty fall farmhouse tray display. 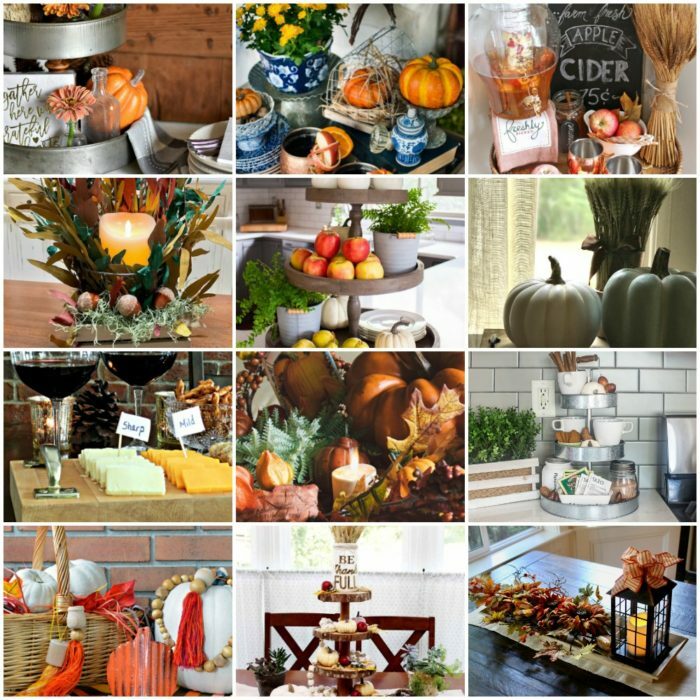 I am joining up with several other creative bloggers for a fall blog hop. Each of us designed a farmhouse tray look, and you can hop from one blog to the next to get tons of beautiful decorating inspiration. 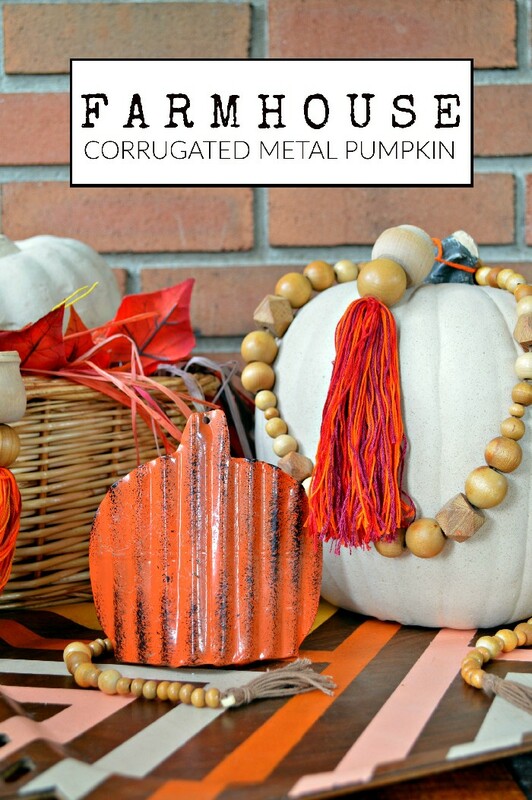 I turned a simple item from the dollar store into a pretty farmhouse corrugated metal pumpkin. Using a needle-nosed pliers, I removed the chain from the three pumpkins. Using a straight edge, I marked a straight line near the bottom of the back of each pumpkin shape. I used my needle-nosed pliers to carefully bend along that line. Finally, I carefully bent the pumpkin into a rounded shape, so that it could stand up on its own. Now I have three corrugated metal pumpkins that look adorable tucked in with other fall decorations. I thought about adding a floral wire vine coil to the hole in the pumpkin stem, but this tray display already had enough going on. 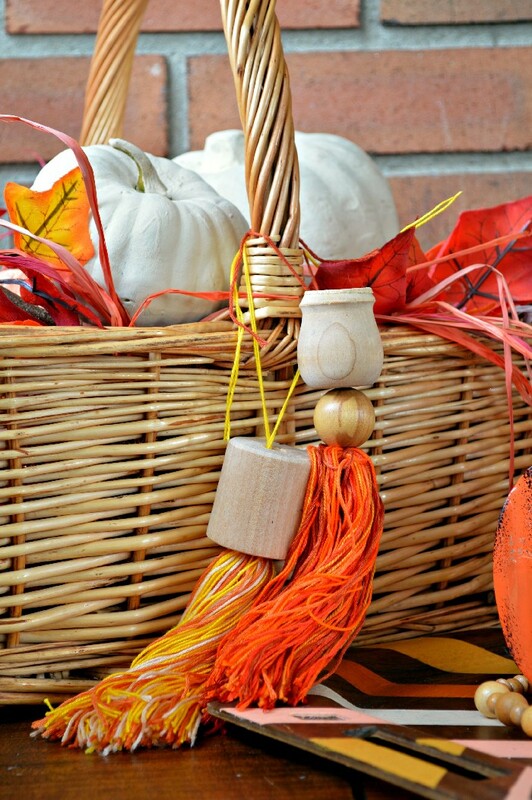 Speaking of the display, I used my Farmhouse Wood Bead Tassels and Wooden Bead Garland to decorate the basket and the pumpkin in the arrangement. I love the way the tassel colors tie into the Striped Ombre Wooden Tray that I painted a few years ago. 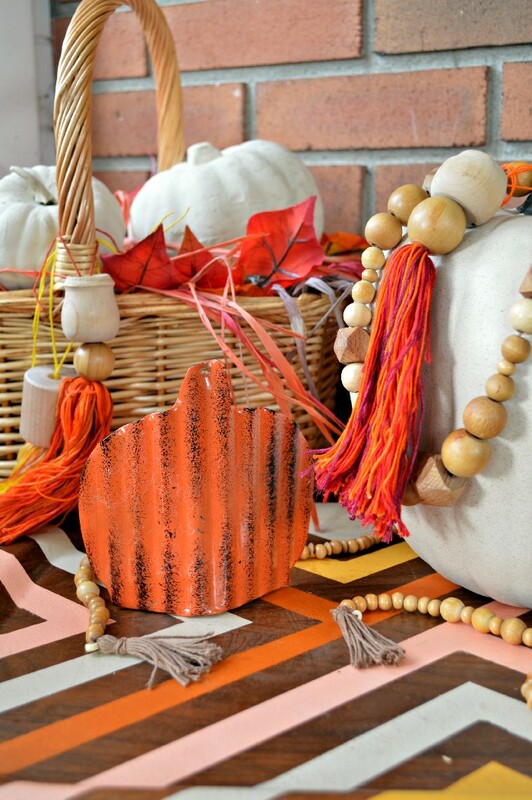 My farmhouse tray display also features a few dollar store foam pumpkins that I painted with chalky finish paint (the same paint I used on the tray), as well as dollar store fall leaf garlands and raffia, all tucked into the basket. 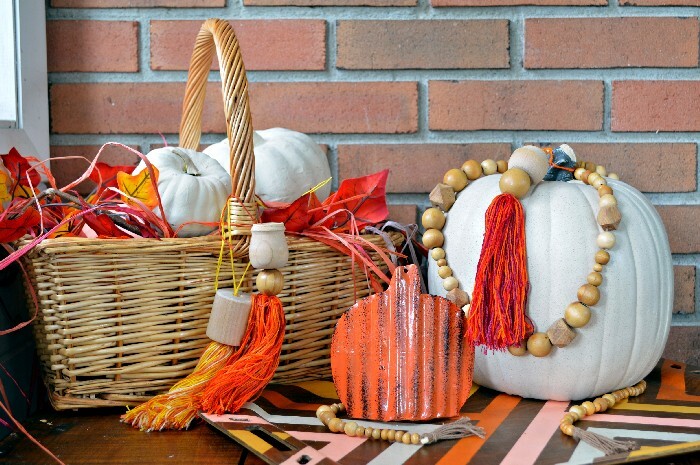 I styled the tray itself with the corrugated metal pumpkin and a white Funkin topped with the bead garland and another tassel. What do you think? I don’t do a lot of farmhouse-style decorating. Did I do okay? Love this entire display, and that corrugated pumpkin is adorable! I love the way your mind works. Dollar store revamps are the best. 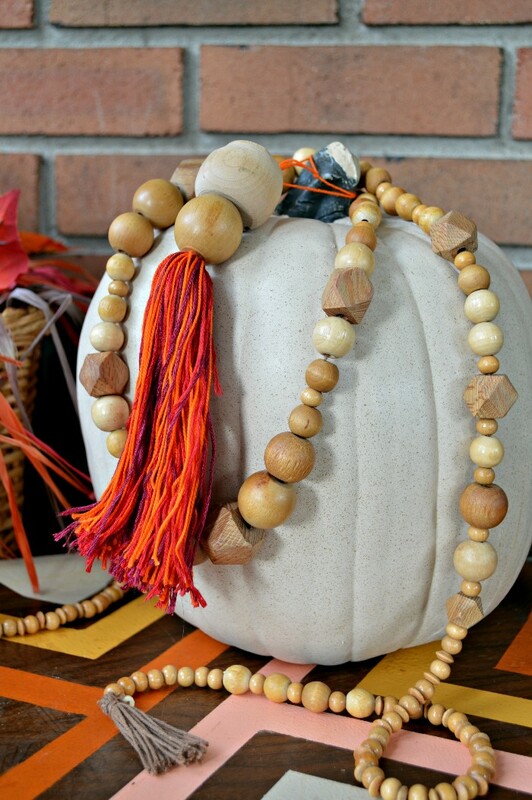 You hit a home run with this idea… it’s smart and so pretty too! So creative! Love how you assembled all the colors and textures to make an amazing display. That corrugated pumpkin is A-DORABLE! So creative, rustic, and perfectly farmhouse!